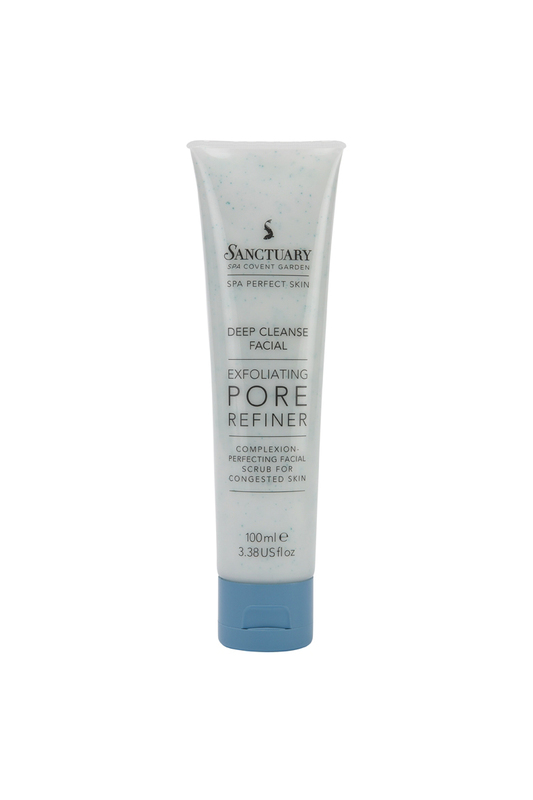 The Sanctuary Spa Deep Cleanse Facial Exfoliating Pore Refiner (A$19.99/100ml) is a complexion-perfecting facial scrub for sensitive and congested skin. The Exfoliating Pore Refiner is housed in an elongated tube with a flip-top lid at the base. The exfoliating formula is therefore, easily dispensed with the bulk of the formula always sitting at the end of the tube. The Exfoliating Pore Refiner has the consistency of a gel cream, not too thick nor thin, and exudes an invigorating and refreshing spearmint scent! The concoction of skin-loving ingredients includes: Witch Hazel to minimise the appearance of large pores, Salicylic Acid to help clear and prevent breakouts and Seaweed extracts to balance the level of essential and natural skin oils. These ingredients combined including Jojoba and Bergamot Oils are wonderful to my skin, leaving it feeling beautifully soft, hydrated, clear and rejuvenated! The formula also contains miniscule, but visible blue exfoliating beads which help to deeply and thoroughly cleanse and remove impurities trapped inside my pores. These exfoliating beads are incredibly gentle to my sensitive skin as it effectively buffs away dead skin cells and as a result my skin feels silky smooth to touch. You only need to use a pearl sized amount of product and gently massage the cheek and nose areas first followed by the forehead, chin and jawline. I tend to reach out for this Exfoliating Pore Refiner three times a week to give my skin some TLC and ensure breakouts and blemishes are nowhere to be seen! The Sanctuary Spa skincare range is available at Priceline stores nationally. Do you use a facial exfoliator in your skincare routine? Have you used any skincare products from The Sanctuary Spa range?